Book Your MOT / Service / Repair Now! We can take care of all your MOT Testing needs up to class 4. We have a fantastic customer waiting area with free wifi and tea/coffee facilities. Our MOT test view area means waiting for your vehicle doesn’t have to be a chore. Our service department can cater for all your Skoda / VW needs using fully up-to-date diagnostic equipment (VACDS). We stock all VW service items and follow the servicing schedule to the letter so not to invalidate any warranties. We can offer two fully insured loan cars that our customers can use while we look after your vehicle requirements for the day. Alternatively we can offer to collect your vehicle within the Harrogate District free of charge. We use up-to-date software for diagnostics called VAG COM which gives us the ability to quickly solve any problems you may have with your car. We specialise in diesel particle filter problems and engine management fault, ABS, airbag systems and A/C. We can cater for all VW and Skoda air conditioning service and problems and most other brands with our up-to-date equipment and air conditioning machine from Bosch. 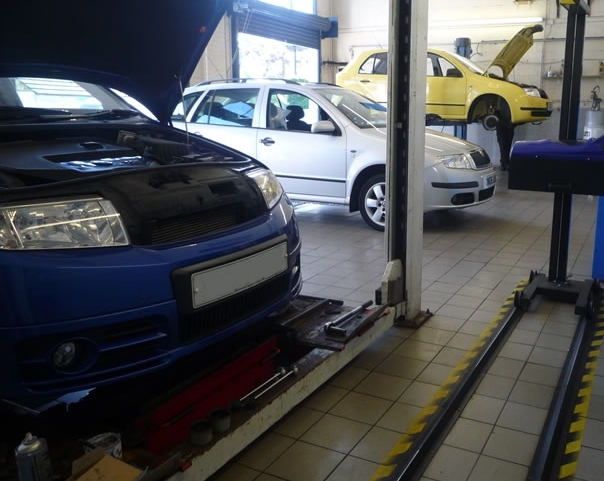 We have a fully heated and tiled three bay workshop with tyre fitting bay, MOT testing lane and air conditioning machines. This give a good clean clutter free environment in which to leave your car in safe hands.